Southwest Silver Gallery is proud to be the premiere source of authentic Southwestern Native American jewelry. 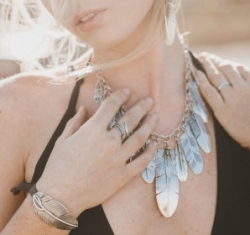 We carry a wide variety of genuine American Indian pieces sourced from the best artisans from local Navajo, Hopi, Zuni, and Santo Domingo tribes, including multiple award-winning jewelry makers. Own a truly one-of-a-kind, timeless piece of wearable art that’s sophisticated, versatile, and always in style. There are many different types of Southwestern Native American jewelry, and each tribe has its own signature style and crafting methods. 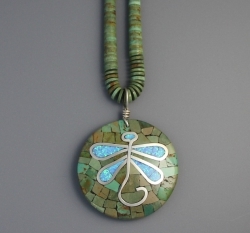 We source our exquisite jewelry from highly skilled artists, many who are world-famous. Choose from Zuni jewelry, Santo Domingo jewelry, silver feather jewelry, heart-shaped jewelry, and more. 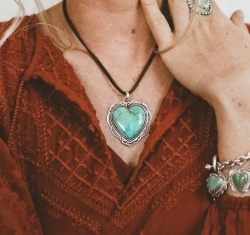 We only sell authentic jewelry handcrafted from genuine turquoise and other gemstones, so browse our hand-curated collections with confidence. Southwestern Native American jewelry has become increasingly popular recently, leading to an influx of low-cost alternatives that don’t encompass the passion, detail, and artistry found in the jewelry we carry. As a trusted source of authentic jewelry, we always go the extra mile to ensure complete authenticity and transparency at all times. In fact, most of our jewelry includes the artist’s hallmark and/or a certificate of authenticity. When you shop at Southwest Silver Gallery, you’ll receive an heirloom-quality piece crafted from the finest stones and materials. If you have any questions about our selection of Southwestern Native American jewelry, call us today at 888-476-4367 to speak to one of our friendly and knowledgeable associates.